Hello June you gotta be great! Focus on the quality of my content rather than the Quantity. Workout more and stick to my workout days. If you're someone that lives by listing things you would probably add a whole bunch of notes in your phone so you won't forget anything.Honestly, if you look in my phone there are tons of notes going back years and it can be quite frustrating when you have to scroll all the way back for something you noted a while back. So I've decided to go back to basics and use a diary. In fact, I'll be using a few diary's and notebooks so that I can separate the different area's of my life and be a lot more organized. In terms of making a list, I usually start compiling a list on paper when I have a lot of task's and a lot of deadlines to reach and I don't want to lose track. But what I've realised from the last "work overload"is that listing should not only be for crunch time it should be a part of your every day especially if you have a very busy schedule. Writing a list in your diary for each day and ticking off or highlighting what you've done not only helps you become more productive but you get an idea of how you are managing your time and how much you can handle in a day. In fact in the beginning of doing this over a week I realised I was listing so much task in one day that I would end up carrying over things to the next day all the time which made me feel like I wasn't being productive and a bit deflated.Currently, I divide my task each day according to what I can handle and if I'm feeling really ambitious I start a few task for the next day. Making a list in my diary or notebook has also helped me feel like I am a bit more in control which reduces the feeling of being overwhelmed( panic mode lol). Once upon a time I use to depend on my not so dependable memory to remember appointments, meetings or even deadlines until I discovered planners. I absolutely love planners, the prettier the better. In fact, I have bought a few calendar planners that have been so cute I have had a hard time bringing myself to write on them, I know all of you can relate. Also, another great way to keep on top of all your appointments and meetings is to set a reminder on your phone. We've all been there when we thought that the doctor's appointment was on Wednesday and it was actuallyTuesday or we thought the staff meeting was at 2pm but it was actually at 12pm and we had to do the walk of shame arriving late or at the bitter end. I am still getting use to setting reminders on my phone but when I do it saves me the trouble planning my apology for something I missed or was late for so it's definitely something I will be practising more this month. Be determined to achieve my goals, I'm realising that determination is a mindset that will impact on my actions. It's one thing to set out all my plans and strategies to achieve my goals in the month of June but if I don't take myself seriously or I slack off then I'll be back in July stating how nothing was accomplished and my goals are still the same. What I have also done to stay determined or motivated is to write post-it notes with quotes encouraging myself, positivity really does go a long way especially when you work on your own. 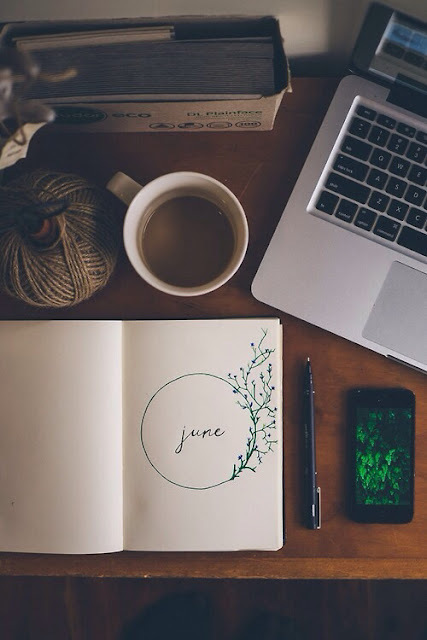 What are some of your goals for the month of June? Leave a Comment Below I would love to know.